My sunroom office got some new updates this week! 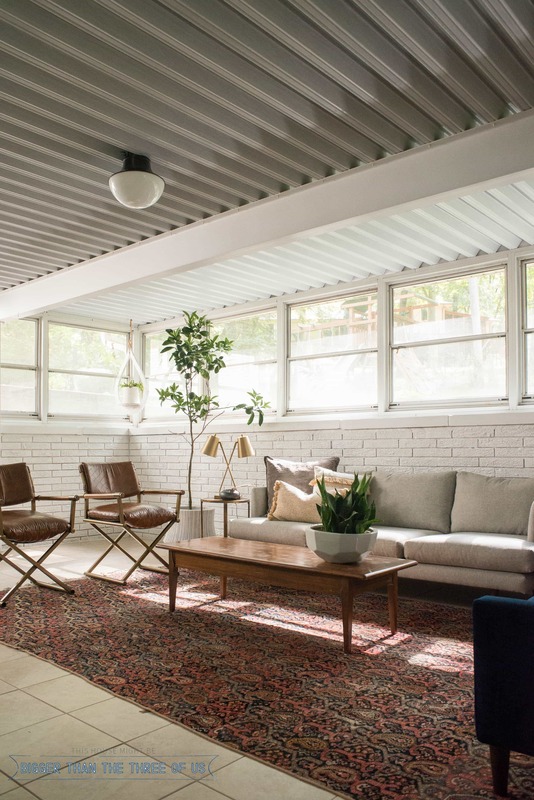 I’m sharing the sunroom lights as well as the sunroom seating and how the space is working for me! Do you have a space in your house that gets the leftover decor, furniture, etc.? I’m sure you do, because most of us can’t afford to go out and buy new furniture, flooring, etc. for all our spaces. For me, that space is my sunroom office. 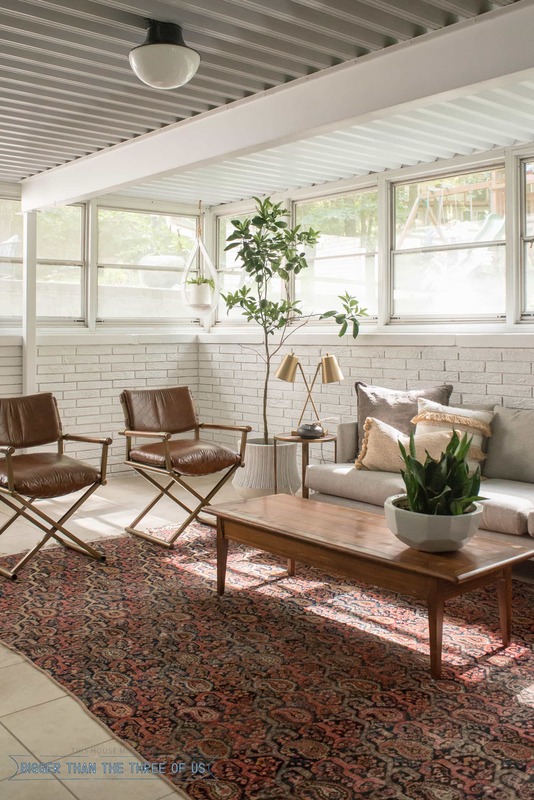 I’ve been using the sunroom as my office for almost a year now and, although it’s been an amazing place to work… it’s such a huge space that I’m just now getting it to where it has a bit of personality. And those are the larger sunroom room sizes! 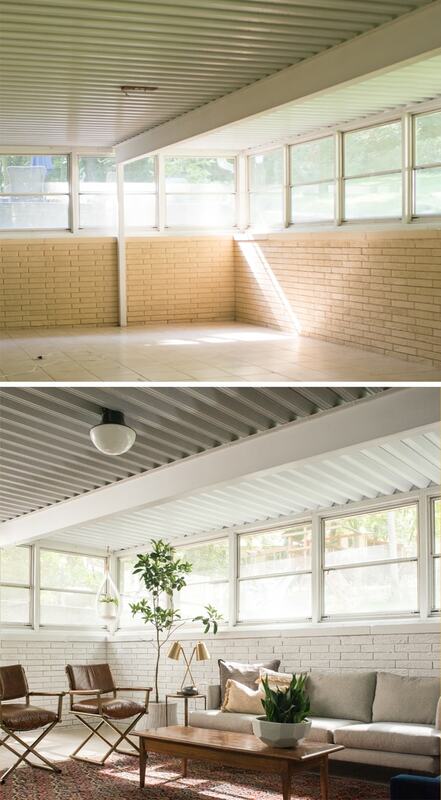 For reference, our sunroom is massive and comes in at 14.4′ x 30′! 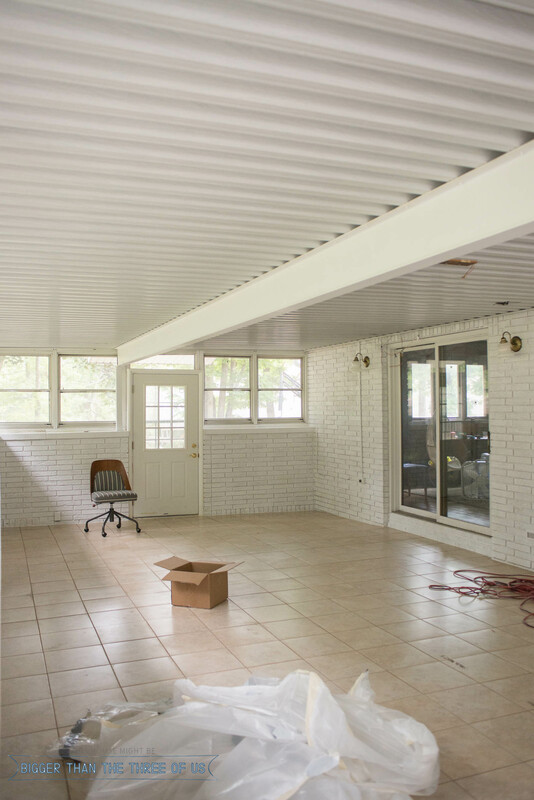 Yes, our sunroom is 30′ long! Even with those updates, there are still a ton of things that I’d love to do. Those are all projects that will be one-off projects that happen over the next few years but, until then, let’s celebrate the major progress that has occurred since that before picture! Whoa, right?! Seriously, it might not be even close to being finished and it might have pieces that are leftover furniture from other spaces, but it’s still a “whoa” in a good way to me! As I’m sure you can imagine; the larger the room, the more furniture, lighting, art, decor you need to make it feel lived in. I’ve been slowly making changes to the space over the last six months and am just now feeling like it’s starting to have its own vibe. Although, I have made plans for the space for the future, I’m loving the baby steps in the sunroom office and couldn’t wait to share with you guys! *Hudson Valley Lighting graciously gifted me with two overhead lights for our space. I only partner with brands that I’d naturally buy from (and actually have one of their lights in my bedroom!). Feel free to read my privacy and disclosure policy if you’d like more information. Let’s talk about what is going on! So, like I mentioned earlier, I was able to work with Hudson Valley Lighting for our space. I chose two of the Lettie flush mount lights in old bronze. The height of the ceilings made a flush mount make the most sense. I wanted a light with a bit of flair but also one that felt modern and timeless. I think the Lettie was the perfect choice! 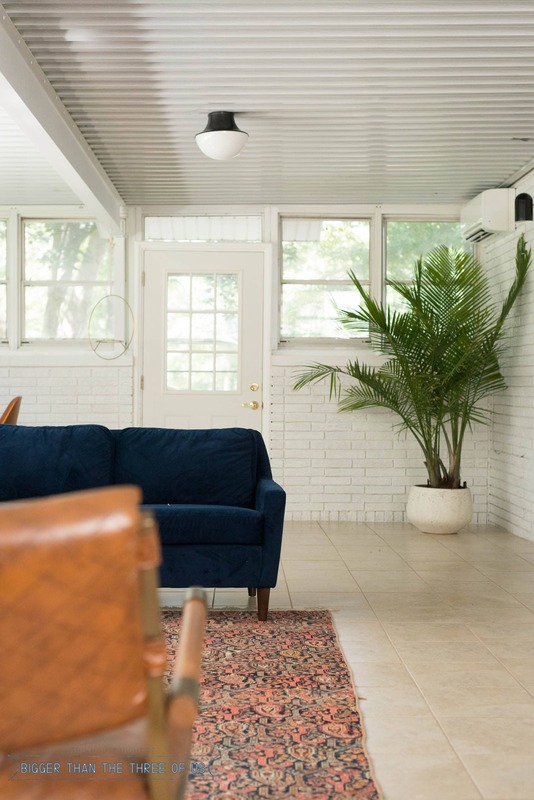 We’ve made a few changes in our living room which has allowed some of our furniture pieces to be moved to the sunroom. I don’t *need* a sitting area in my sunroom, but that doesn’t mean I can’t enjoy the sunroom seating that’s now in there. Patio plants are slowly making their way into the space as well. The weather is turning colder so the plants had to go somewhere. 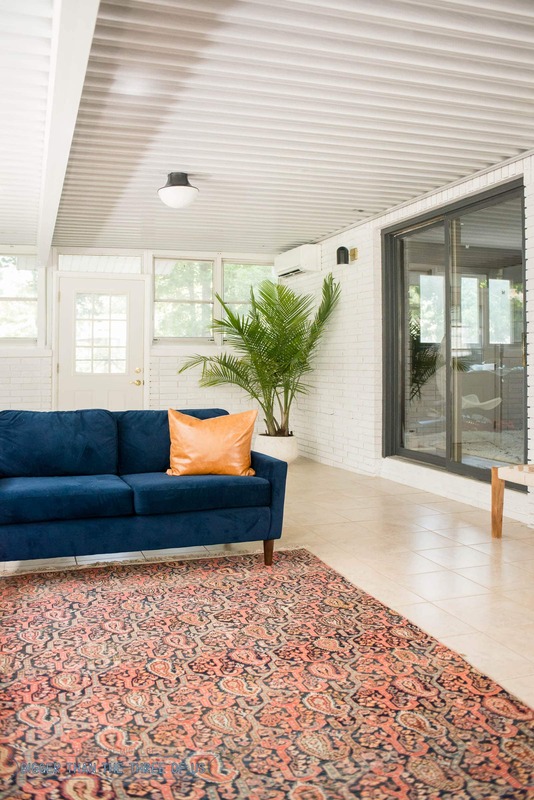 I’m not, at all, mad about the sunroom being filled with plants though. I love the vibe that greenery adds to a space. Many of the pieces in this room are vintage or collected over time, but I did try to round-up exact links for those that were available and look-a-likes for everything else.